How to add a tiled style gallery to your site. 1. Click the gallery to select it. 2. Go to the Gallery Settings tab in the right sidebar. 3. 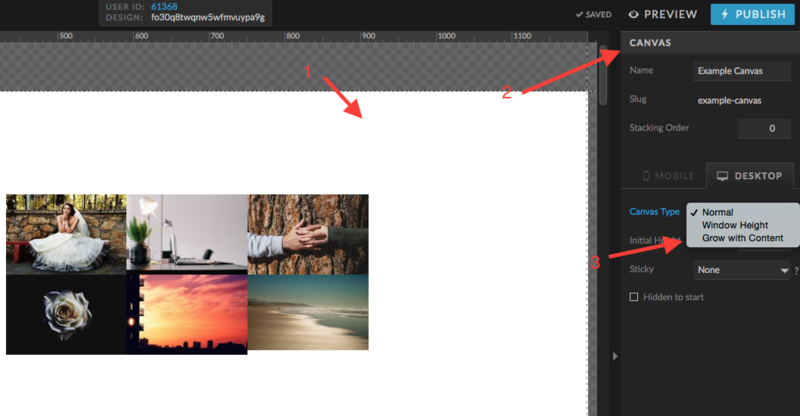 Click the drop down menu next to the gallery type option and select tiled gallery. Now that you have created your tiled gallery on the canvas, we need to adjust one canvas setting as well in order for the tiled gallery to properly function. 1. Click the canvas your tiled gallery is on to select it. 2. Choose the canvas tab from the right sidebar. 3. Change the canvas type to "grow with content"
We want the canvas type to be set to grow with content so that it will grow to accommodate all of the images in your tiled gallery, otherwise the gallery will be cut off at the bottom of the canvas.